For the first time, a Los Angeles-based gallery will be collaborating with the Santa Barbara Art Foundry to produce an art show. TAG Gallery, an established Bergamot Station art gallery, will occupy the large gallery space at the Santa Barbara Art Foundry from June 14 – July 14, with a reception on Saturday, June 21 from 5-8pm. Opened in October 2013, the Santa Barbara Art Foundry is a producer of high-end bronzes, including selected Erté pieces. Tours of the foundry offer a behind-the-scenes look at the surprisingly high-tech operation. There is a wine tasting room on the premises, and the soaring gallery is the exhibition space for finished bronzes, and for a month this summer, the work of 10 of TAG Gallery’s artists. The June 14 – July 14 show will give Santa Barbarans a convenient way to peruse and collect work from one of L.A.’s long-established galleries, and Angelenos a chance to acquaint themselves with the finest bronze foundry in Southern California. 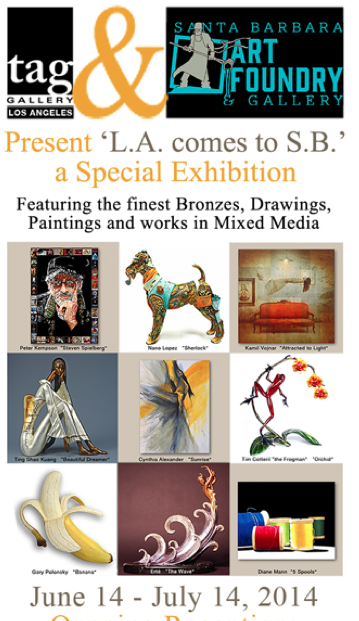 The Santa Barbara Art Foundry is located at 120 Santa Barbara Street, in the city’s charming arts district known as the Funk Zone. More information, including availability of group-rate hotels nearby, may be obtained by calling the foundry at 805-324-4230.